I went camping at the Outer Banks with a travel group over a weekend. It was the first time I’ve ever camped, but it was car camping; we had a large group; and we weren’t all that far from civilization, so I wasn’t too worried. We camped at the on Ocracoke Island. 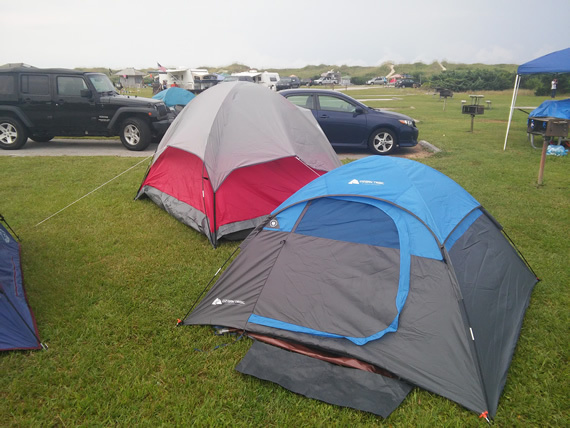 The Cape Hatteras National Seashore covers portions of the Outer Bank south of US Route 64, including the campground we stayed at. From the Triangle, it was a four hour drive to the ferry terminal at Hatteras, and then an one hour ferry to the island. The vehicle ferry is actually free, which is nice. The drive to the campground had some nice scenery to it too, as we passed by a number of Outer Banks beach towns along the way. The nice thing about the Outer Banks is that it isn’t overly commercial, and most of the accommodation are in the form of vacation homes. The homes are 3-4 stories tall, on stilts (likely to ward of flooding), and have a lot of decks and balconies for people to soak in the sun rays. Back to the trip, once we reached the island, the campground is just several miles down the road. Ocracoke Island is not that big and only has one main road down the island, so getting lost was unlikely. We arrived at the evening just before sunset, and we hurried up to get our tents set up. Although I am a camping newbie, the dome tents that most stores sell these days are pretty simple to set up, so I didn’t have too much trouble. The impending darkness made things a little more interesting, but the group worked together to get each other’s tents up. 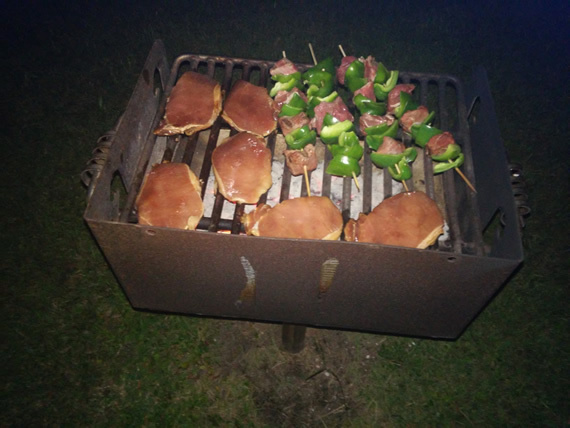 After getting our tents up, the group grilled stuff in the dark, which was also an interesting experience. A couple astute member had headlamps and lanterns, so we could sort of see. I bought a box of marinaded pork chops to share, but I ended up eating most of them over the course of the weekend, because people brought a lot of food. Grilling in the dark. I brought those pork chops. Camping for the first night was a little rough, mostly because it was quite warm and so I had trouble sleeping. My sleeping pad + sleeping bag combination for padding also wasn’t the most comfortable, and I barely fit in my tent. I bought a cheap, small 7′ by 7′ “two person tent”, but really it only had enough room for me to sleep diagonally. I do like that the tent is very compact, so it would be a good tent to bring along for backpacking… if I ever choose to be that outdoorsy. Obviously, camping is not as comfortable as staying at a hotel, but it was a lot of cheaper and fun to do with a lot of people. The campground had restrooms and cold showers, so we weren’t really roughing it too much. The other thing that bothered me and a lot of people in our group were biting insects. We found out the hard way that during the summer months, the Outer Banks are swarming with tiny biting sandflies/no see-ums that can get through the screens on our tents. I sprayed myself liberally with DEET-based repellents, but I ended with bites all over my body. By the end of the trip I had more bites than I care to count. We spent the next day hanging out on the island. 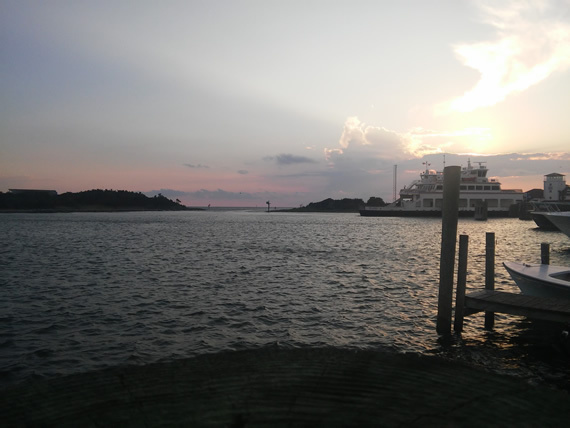 The village of Ocracoke is located at the end of the highway, and it has restaurants and shops to cater to visitors. We had dinner there and the view of Silver Lake Bay was nice. Of course, since we were at the Outer Banks, we had to go to the beach on the ocean side of the island. We went to the one of the beaches with life guards. 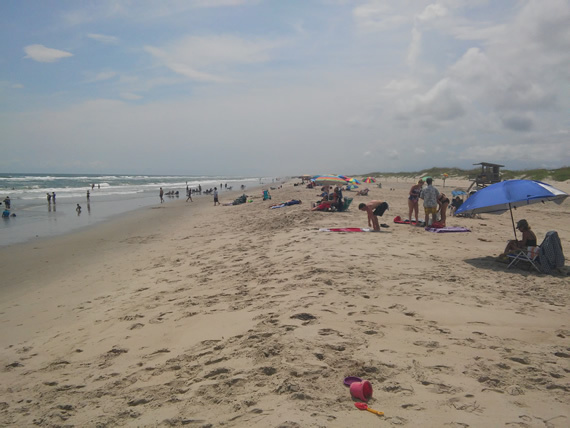 There were people there, but not too many since Ocracoke is a little harder to access than other beaches in the state. The beaches are beautiful and pristine because there are no buildings to be seen from the miles of sandy coast. It was fun soaking in the rays and getting my feet wet in the ocean. Walking down the beach under the full moon. We didn’t limit our beach time to just daytime though, as we also took strolls on the beach at night. It was a full moon outside, so we had no trouble seeing. Supposedly there were some bio-luminescent algae that can be seen, but I didn’t see anything. 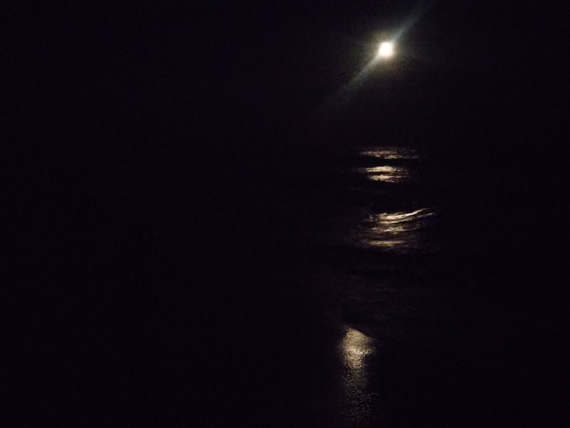 Strolling the beach under the full moon was a memorable experience all to itself though. During one of our late night strolls, we also came across roped off sites to mark where the sea turtles are nesting. Outer Banks is actually a nesting site for sea turtles, and their nesting sites are roped off to protect the eggs. Some of our travel buddies had participated in helping hatchling sea turtles reach the sea in prior years, but we didn’t see any hatching events this time around. 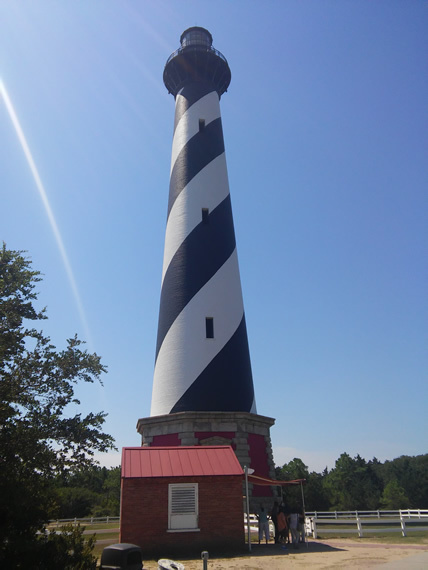 Cape Hatteras Lighthouse and its instantly recognizable black and white swirling pattern. 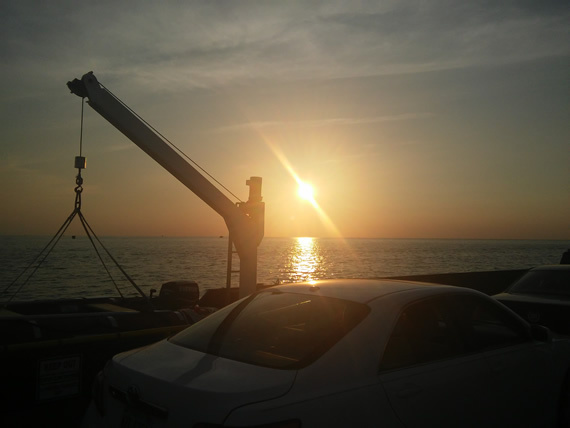 On the last day, we packed up camp in the morning and departed Ocracoke Island. We broke up into different groups since some people wanted to see things along the Outer Banks that other people have already visited. My car was full of first-time Outer Banks visitors, so on the way back we stopped by some of the more notable locations. Our first stop was the iconic Cape Hatteras Lighthouse. This lighthouse is the tallest brick lighthouse in the US, and it was also moved inland by over 2000 feet in 1999 in an impressive feat of engineering. The lighthouse is open to the public and one can pay $8 to climb it. It was only about 10 stories tall, so it wasn’t too much of a workout, and the views from the top were absolutely fantastic. Next we went up to Nags Head and visited the Wright Brothers National Memorial. The Wright Brothers were of course responsible for the first successful powered flight. I knew that the flights took place in Kitty Hawk, but I didn’t know that Kitty Hawk (or more accurately, Kill Devil Hills) is located in the Outer Banks of North Carolina before I relocated to the state. The Memorial has a small museum about the Wright Brothers and what led them up to the historic first flight, and the monument that commemorates their achievement is located on a nearby hill. From the monument, one can see the waters on both sides of the Outer Banks. Our last stop on the way back was Jockey’s Ridge State Park, home to the tallest sand dunes on the East Coast. We didn’t take much of a walk on the sand dunes, but it was an interesting sight to see from afar. The dunes are tall enough that people can take hang-gliding lessons at the park, although we didn’t see any lessons during our brief visit. Overall, my camping trip to the Outer Banks was really enjoyable. It certainly helped that the weather was great for the most part. I visited new, interesting places, got to enjoy the beach and hang out with a bunch of nice people. The whole camping thing wasn’t too bad, since car camping is just roughing it slightly. It would have been more enjoyable if it wasn’t for the bug bites. If I’m going to camp on the Outer Banks again, I probably wouldn’t go in the middle of summer. I also might buy a small air mattress and pump to make sleeping in the tent a little more comfortable. And maybe a lantern or headlamp… there are so many things I could buy haha. Getting ready to put the pedal to the metal. That is me in the blue shirt. 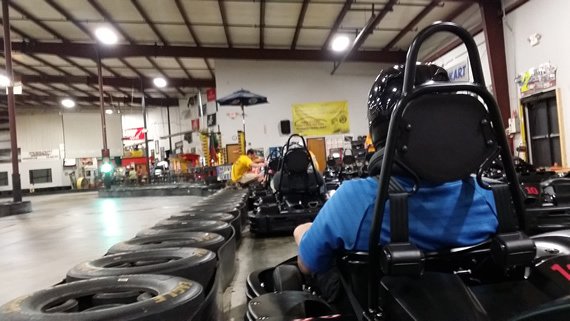 On another weekend, I went go-kart racing with another group. I’ve never driven a go-kart before so thought I’d give it a try, and it’s nice that the facility isn’t too far away from where I live. The package we got included time for practice, and then two 10 minute races. The go-karts they had were pretty powerful and they go fast. It was definitely a heart-pumping experience and loads of fun. Unfortunately, the outing showed me that I am not a very good go-kart driver, as I was dead last in all of the races. I think I was slow because of the combination of me being larger and heavier than my competitors and my habit of driving non-aggressively. Those fast and tight turns also triggered my motion sickness and I was a little woozy at the end of the last race. At the end, go-karting was a fun activity to try once, but I don’t think I’ll be doing it too often. A tigress sitting pretty at the Carolina Tiger Rescue. 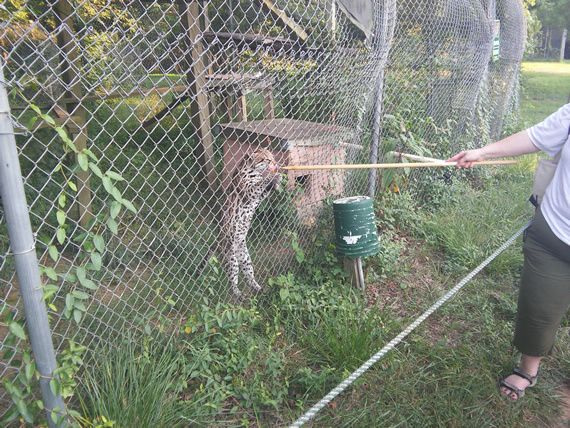 On the same weekend, I visited the Carolina Tiger Rescue out in Pittsboro. As the name indicates, the Carolina Tiger Rescue rescues tigers and other exotic cats (and some non-felines) from private parks and homes etc., and provide a place for these kitties big and small to spend the rest of their lives. They operate tours of the their facilities to help fund the effort. 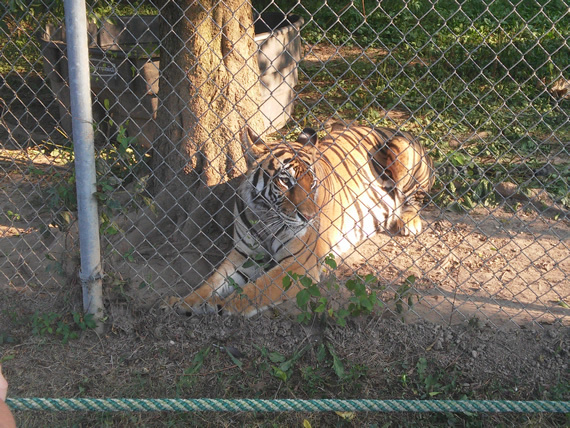 I love big cats, and I have heard good things about the Tiger Rescue, so I decided to visit. An ocelot getting his treat. I went on a twilight tour, during which there are less volunteers and crews working in the facility and when the cats are more active. On the tour, we visited several tigers, lions, ocelots, servals and kinkajous (the only non-feline animals at the facility). During the tour, the tour guide talked about where each of the animals were rescued from, and about their personalities and such. The animals are of course held inside enclosures surrounded by wired fencing, but unlike most zoos, visitors can get to about 3-4 feet away from the fence, which gives you a real up close look at these beautiful animals. The tour guide also gives snacks to some of the residents. I’ve never seen a tiger get fed before, so it was cool to see. If you like wildcats, the Carolina Tiger Rescue is definitely worth checking out.